disables vitally-needed national and international action to limit multiple threats to the environment and the biosphere. It is the single structural cause common to all financial and monetary instability – including the 145 banking crises, 208 monetary crashes and 72 sovereign-debt crises identified by the IMF since 1970. In the current eurozone crisis, it is the money system that is responsible for inflicting high unemployment and other painful side-effects on several countries. The money system = a system of centralised, national currencies (or regional currency in the case of the euro), funded through bank debt, enforced by a central bank (frequently private and profit-making) and run as a monopoly. 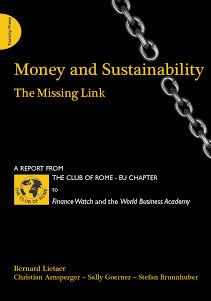 Money and Sustainability: The Missing Link proposes an alternative: a monetary 'ecosystem' with complementary currencies working alongside the conventional one. This is more flexible, resilient, fair and sustainable. Societies worked like this in the past. So can we. The book first explains these systemic problems in detail. It’s written in a way that’s clearly accessible to the general public (although it references at length a wide range of technical topics: economics theory, the history and institutions of banking, the physics of complex flow networks, the science of sustainability, and population trends and climate change). This gives a framework for understanding the present money system. The authors then describe their proposal for an alternative money ecosystem which systematically addresses and resolves the problems created by the present system.